Scientists at the Optoelectronics Research Center have developed strong, lightweight silica nanofibers that are 15 times stronger than steel and can be manufactured in lengths potentially of 1000’s of kilometers. The findings could have help transform the aviation, marine and safety industries. The University of Southampton’s Optoelectronics Research Center (ORC) is pioneering research into developing the strongest silica nanofibers in the world. Globally the quest has been on to find ultrahigh strength composites, leading ORC scientists to investigate light, ultrahigh strength nanowires that are not compromised by defects. Historically carbon nanotubes were the strongest material available, but high strengths could only be measured in very short samples just a few microns long, providing little practical value. Now research by ORC Principal Research Fellow Gilberto Brambilla and ORC Director Professor Sir David Payne has resulted in the creation of the strongest, lightest weight silica nanofibers – ‘nanowires’ that are 15 times stronger than steel and can be manufactured in lengths potentially of 1000’s of kilometers. “With synthetic fibers it is important to have high strength, achieved by production of fiber with extremely low defect rates, and low weight,” said Gilberto. “Usually if you increase the strength of a fibre you have to increase its diameter and thus its weight, but our research has shown that as you decrease the size of silica nanofibers their strength increases, yet they still remain very lightweight. We are the only people who currently have optimized the strength of these fibers. “Our discovery could change the future of composites and high strength materials across the world and have a huge impact on the marine, aviation and security industries. We want to investigate their potential use in composites and we envisage that this material could be used extensively in the manufacture of products such as aircraft, speedboats and helicopters,” he added. David explained: “Weight for weight, silica nanowires are 15 times stronger than high strength steel and 10 times stronger than conventional GRP (Glass Reinforced Plastic). We can decrease the amount of material used thereby reducing the weight of the object. The research findings came about following five years of investigations by Gilberto and David using Gilberto’s £500,000 Fellowship funding from the Royal Society. 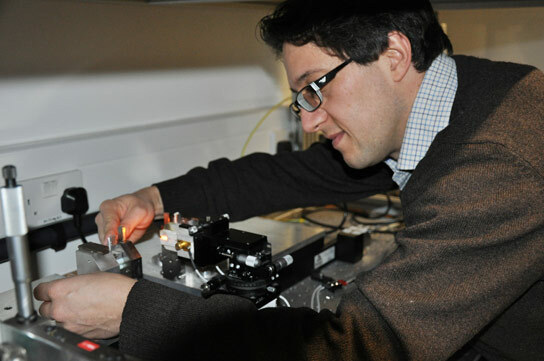 Gilberto shared his findings with fellow researchers at a special seminar he organized in November 2012 at the Kavli Royal Society International Center, at Chicheley Hall, in Buckinghamshire. “It was particularly challenging dealing with fibers that were so small. They are nearly 1,000 times smaller than a human hair and I was handling them with my bare hands,” said Gilberto. “It took me some time to get used to it, but using the state-of-the-art facilities at the ORC I was able to discover that silica nanofibers become stronger the smaller they get. In fact when they become very, very small they behave in a completely different way. They stop being fragile and don’t break like glass but instead become ductile and break like plastic. This means they can be strained a lot. “Up until now most of our research has been into the science of nanowires but in the future we are particularly interested in investigating the technology and applications of these fibers,” said Gilberto. 1 Comment on "Scientists Develop Glass Nanofibers that are 15 Times Stronger than Steel"
Is 15 X the strength of steel enough for the space elevator? Assuming of course you can make a few million kilometers of it!